I sewed up a dress from this 1964 pattern last winter for Little V.
I sent the pattern away to one of you before V ever wore the dress. Now I wish I'd made 3 of them. (as if she needs any more dresses...) I love the swingy retro style! That's so cute! It could be made with any basic bodice pattern. a welcome smile as not been a nice week, my cousin passed away on sunday night, at least shes not suffering now. thanks little v for your upliftingness! ps sorry i missed your red giveaway, was with my cousins daughter yesterday. so cute!! 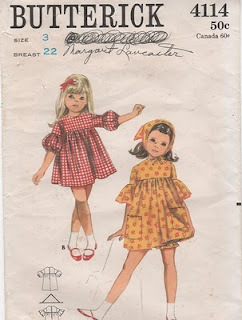 i just bought some vintage patterns from the secondhand store this morning! LOVE it!! Oh I missed this post! And LOVE IT!!! That dress/pattern is just wonderful! Cute! Cute! And we've been watching Anne of Green Gables here, and those "puff sleeves" make me think of her! Very sweet!